If you think German spas are old fashioned, it’s time to catch up. German spas are becoming more hip, glam and glorious. BADEN BADEN, GERMANY – If I wasn’t lying here naked like Gollum on an iceberg I’d no doubt be enjoying the Blue Space liquid relaxation room more, but here in southwestern Germany, at Baden-Baden’s famous thermal bath complex, the Caracalla Therme, the sauna area is clothing free, so if I want to sweat I have to strip. At least, in this modern confection of a bathhouse with its jet pools, pillars and waterfalls, bathing suits are required everywhere else so I don’t need to go au natural for long – just long enough to check out the latest in sauna and relaxation technology. The Blue Space, designed by Viennese artists, sha & GTT evokes the serenity of air, sky and water, and the interior is so hip it blurs the line between reality and art installation. Illuminated lounge chairs resemble molded ice, the ceiling is a moving netlike ocean of waves and the music isn’t music at all, but Sounds, specifically composed to induce feelings of wellbeing. When did German spas get so hip? 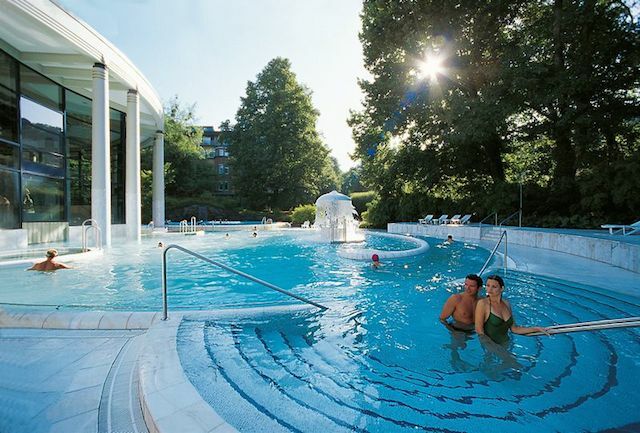 After Baden-Baden I head southeast to another German spa in the town of Baiersbronn. Tucked into the hills of the Black Forest, Baiersbronn is impossibly picturesque. Pine trees gleam in the sun, geraniums spill from windowsills and it seems impossible that anything hip could infiltrate its firm folkloric foundations. To test the waters, I sign up for a traditional Zuberbaden at the Hotel Lamm. The Zuberbaden, loosely translated as a bath in a monstrous wooden tub, dates back about 200 years when villagers didn’t have washing facilities in their homes but used communal baths. After entering the log cabin bathhouse behind the hotel, I’m given a bathing uniform of baggy shorts, bandeau top and cotton teardrop-shaped shower hat. Feeling like a garden gnome, I make for the tub. It’s so big I have to climb a ladder to get into it. It’s a DIY bath, I soon learn from my therapist, Sibella. Sitting on a bench, ankle deep in water, I start scrubbing myself with salt. But while those villagers of yore no doubt used any old salt to exfoliate and detox, nowadays the Zuberbaden is holistic. This salt is a special healing mix blended with semi-precious stones like onyx and rose quartz. Take that, ancient tradition! After the salt scrub, which stings because I’ve no doubt been scouring with too much energy, the tub is filled with water. Sibella keeps loading in regional ingredients like pine extract, honey, chamomile and lavender, somehow finding time to give me a shoulder and neck massage while I’m busy smearing mud on my face and chalk on my body. It’s hard to keep up with everything going on, but luckily, the sparkling wine I’m drinking takes my mind off my confusion. Staggering out under an immense bounty of health-giving ingredients, I get a good night’s sleep before heading on to Garmisch-Partenkirchen, a chic alpine town near the Austrian border. 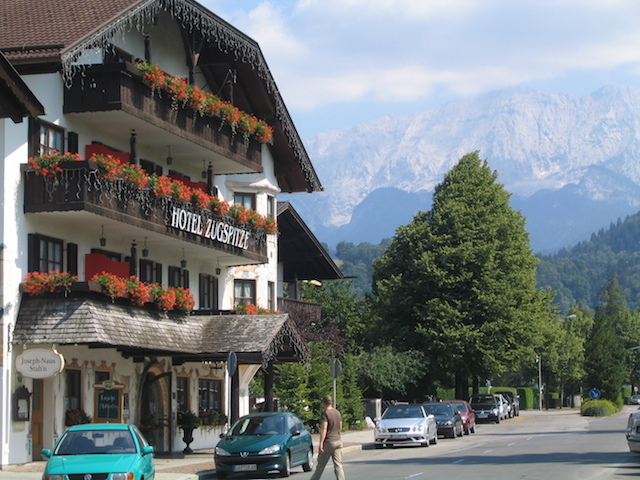 A popular ski resort and hiking destination, Garmisch-Partenkirchen is home to Germany’s highest peak, the Zugspitze. Is a Hay Bath hip or historic? 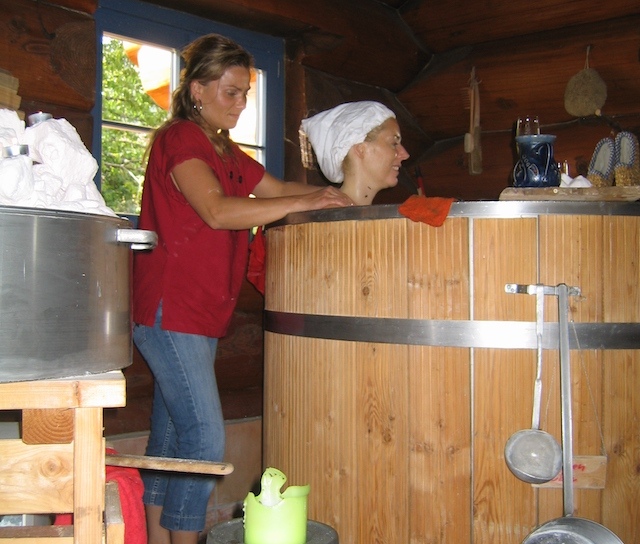 The lofty mountains and alpine meadows have contributed to a popular German spa treatment called a Hay Bath. This, I learn at the Hotel Zugspitze’s spa, doesn’t involve bathing in water at all. It entails lying on top of it, by means of a high-tech machine called a soft pack couch that resembles a tub with a treatment table on top. 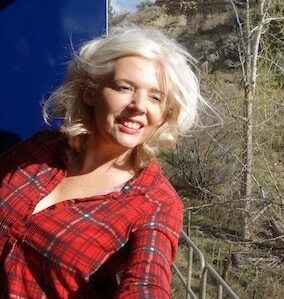 Over the table is a bed of sweet-smelling hay, certified organic and grown specially at high altitudes. I lie down on the hay, get covered in more hay, then the table underneath me opens like a trap door and I’m suspended over liquid, waterbed style. It’s hot. So hot I’m sweating enough to fill a tub of my own. Any hardy toxins that have managed to stay in my body after Baden-Baden and Baiersbronn don’t stand a chance now. To get my mind off the heat, I rock from side to side, creating gentle waves. The Germans are amazing, I think, lolling back and forth on my bed of fragrant greenery. Not only are German spas becoming more hip, they’ve updated a roll in the hay. Baden-Baden, Visit the baths at Caracalla Therme www.caracalla.de. For a luxurious spa hotel, consider the deluxe Brenner’s Park.